Note: This project affects approximately ten percent of the residential properties in Avalon. Under the direction of Mayor Martin Pagliughi, South Jersey Gas will be performing the installation of approximately 650 Excess Flow Valves (EFVs) throughout the Borough starting in late March and ending before Memorial Day weekend. These valves are an integral safety component that will protect private homes and property in advance of a catastrophic storm event. This program is authorized for the Borough and other coastal communities under an approval from the New Jersey Board of Public Utilities approved “Storm Hardening and Reliability Program that permits South Jersey Gas to conduct various resiliency infrastructure improvements. “The installation of these EFVs in advance of the summer storm season will provide added protection for property owners in the event of a significant storm event in our area”, Pagliughi said. 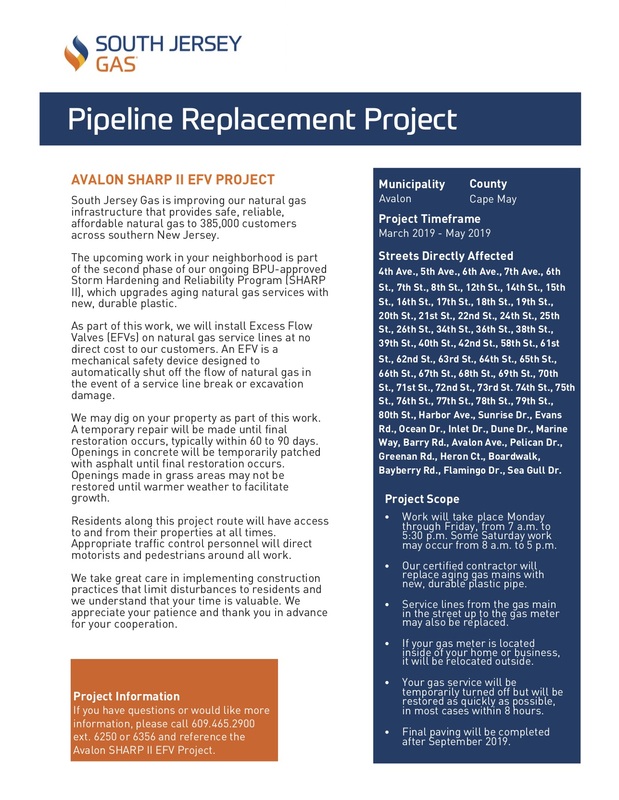 “There will be temporary inconvenience in sections of Avalon where the valves are needed but this effort will provide long-term sustainable resiliency for natural gas customers”. The valves are installed between the natural gas main and a customer’s gas meter. They are designed to automatically restrict a customer’s service when the natural gas flow exceeds certain limits, such as when a service line is damaged due to a storm, excavation, or other circumstances. When activated, the EFV stops the flow of natural gas, limiting the risk of escaping natural gas due to damage or pipe failure. This is part of a town-wide effort to replace antiquated aging steel gas mains with new elevated pressure mains that will increase both resiliency and reliability for coastal communities, including Avalon. EFVs are being installed at homes that do not have an EFV. 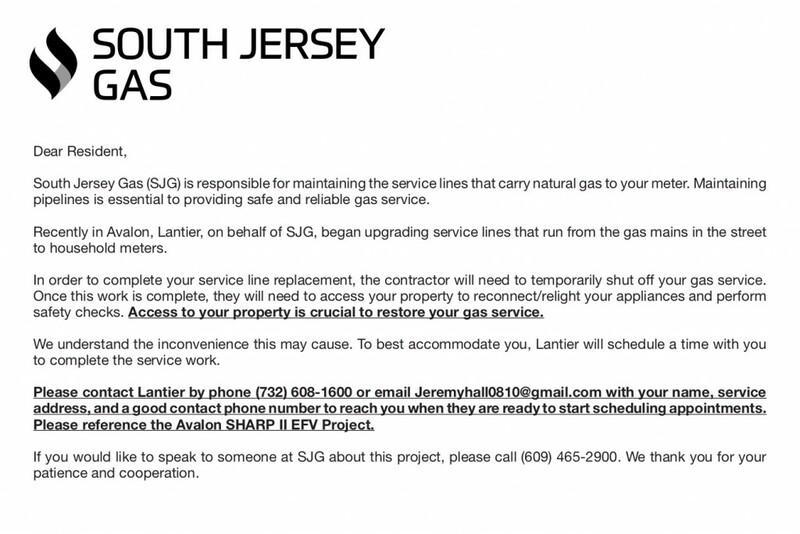 No work will be conducted by South Jersey Gas after Memorial Day weekend, through the summer. Crews from South Jersey Gas and its contractor, Lantier Construction, are anticipated to begin work on or about March 25th, 2019 with all of the work to be completed in advance of Memorial Day weekend. Crews will be working full days during the week, and a limited schedule on Saturdays in order to facilitate the installation. Only residences in need of a EFV will be contacted directly by the utility with a postcard. A fact sheet with additional information will be placed, by the contractor, on every door where work will be done. The installation of the EFV will require a small street opening, close to the curb, with a temporary patch in the street. Gas service will be temporarily shut off by the utility in order to install the valve. To best accommodate customers, Lantier will schedule a time with the customer to complete the service work and restore natural gas service to the property. Temporary patches will exist in the street through the summer. South Jersey Gas and Lantier will return to the Borough after Labor Day weekend to conduct full and half street paving for streets impacted by the gas main replacement and EFV installation projects. The utility is also obligated to repave and repaint any sections of the Avalon Bicycle Path that have been impacted by these projects to “new” conditions.